When students (and others) disrupt events where speakers are trying to make arguments they dislike, they say that their conduct is justified. Most commonly, the disrupters maintain that they are merely preventing “hate speech,” which allegedly doesn’t enjoy the protection of the First Amendment. Therefore, they are perfectly free to keep such speakers from being heard. In fact, they assert that they’re acting righteously by protecting against speech that leads to violence or oppression. Student zealots, such as those who prevented University of Oregon president Michael Schill from giving a speech, argue that. So, evidently, do some college leaders, as we read in this article. Their argument, however, suffers from two fatal flaws. Nothing in that language suggests that government officials are entitled to make an exception for speech they regard as hateful. 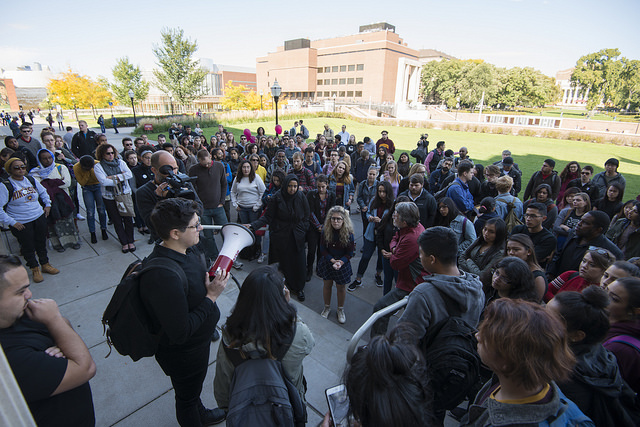 Students and college officials have often justified their actions to silence speakers by claiming that they are simply preventing speech that could lead to violence or contains words that are inherently injurious. That justification, however, won’t hold up. But as Sean Clark explains in his FIRE essay, “Misconceptions About the Fighting Words Exception,” the Supreme Court began to back away from Chaplinsky just a few years after announcing it. In 1949, a case came before it, Terminiello v. Chicago, that seemed to fall easily within Chaplinsky. Rather than a single angry man yelling at a sheriff, in Terminiello we had an angry Catholic priest who denounced Jews at a large event organized by Christian Veterans of America, where a large number of protesters outside the hall were throwing rocks. Fighting words? Unquestionably so. The function of free speech under our system of government is to invite dispute. It may indeed best serve its high purpose when it induces a condition of unrest, creates dissatisfaction with conditions as they are, or even stirs people to anger. Speech is often provocative and challenging. It may strike at prejudices and preconceptions that have profound unsettling effects as it pressures for the acceptance of an idea. Therefore, neither campus officials nor students have any legal grounds to prevent or disrupt speech because they say it has “fighting words” that could be offensive to listeners. Those who want to silence speakers have also tried another argument. They maintain that only governmental actions can violate the First Amendment. And since they—student protesters—don’t have any governmental power, they are free to do whatever they want to prevent speech. In short, while the anti-speech protesters are correct that the First Amendment does not apply to private conduct, it does not follow that their conduct—such as the way ACLU spokeswoman Claire Gastanega was shouted down at William & Mary in October—is legitimate. Apropos of the William & Mary incident, President Taylor Reveley said, “Silencing certain voices in order to advance the cause of others is not acceptable in our community.” That gets at the crucial point: Colleges are entitled to make the rules for conduct on campus, not a group of students. Public institutions cannot have rules that impinge upon First Amendment rights; private ones can have speech suppressing rules if they want, but no group of students gets to set them. Consider the case of Claremont McKenna College, where last year an aggressive mob of approximately 170 students (and probably outsiders as well) blocked invited speaker Heather Mac Donald from giving her planned talk. They shouted, chanted, banged on drums, and declared that Mac Donald is a white supremacist who denies that black people have a right to exist. In sum, there is no justification for protests that prevent speakers from being heard and college officials (or law enforcement officials if state laws were broken) are perfectly justified in punishing those who refuse to abide by the rules. Allowing the heckler’s veto to operate would, as Gillman and Chemerinsky conclude, “represent an abandonment of foundational principles of modern American higher education.” If we’re lucky, 2018 will be the year when people on our campuses stop saying they have a right to disrupt free speech.